Connect & Stream Audio from External Devices. Amp Power: 2 x 120 Watt MAX. USB Flash Drive Reader. Audio Source Input Selectable. Aux (3.5mm) Input. Maximum USB Flash Support: 32 GB. Rated Power Input: 750mV. 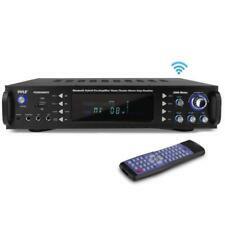 Pyle Bluetooth Stereo Amplifier Receiver with FM Radio, USB, SD Memory. Shipped with USPS Priority Mail.
' ' ---Converts Phono Signals to Line Level Signals ---State-of-the-Art Circuitry Accommodates Magnetic Pickups ---Ultra-Low Noise Operation Improves Sound Performance ---Connects to Turntables and Other Studio Equipment ---Input Sensitivity: 3mV at 50K Ohms (Phono) ---Dedicated RCA and 1/4'' Output Connectors ---Output: 2V max (P-P) at 10K Ohms ---DC 12-Volt Power Adapter Included ---Frequency Response: 20 Hz ~ 20 KHz ±2dB ---S/N Ratio (A-WTD): 70 dB - Output Level: 2V ---THD: 0.08% @ 1KHz and 3mV Input | S/N Ratio: 70dB ---Input Sensitivity/Impedance/Phono 3 mV / 50K Ohms ---Load Impedance: 10K Ohms - Reference Voltage: 1V d ---Dimensions (W x H x D): 3.54" x 2.13" x 1.02" ---Sold as: Unit ---Weight: 0.85 lbs. This electronic preamplifier stands up to the test and will provide you with serious sound performance. Karaoke / PA Stereo Amplifier. The Pyle PMXAKB2000 karaoke mixer features Bluetooth wireless streaming from your device. The amplifier produces a powerful 2000 watts (1000W 1000W at 4 Ohms) of power and the mixer features two microphone inputs, two line inputs and two video I/O connections. 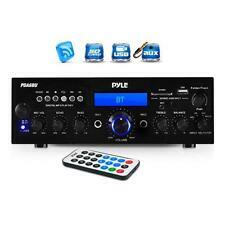 Pyle PFA220BT Mini Bluetooth Amp MP3/USB/SD. Gives you 2x40 watts peak power which can be used for speakers w/ 4-8 ohms impedance, enjoy high-quality music and movies. Using sophisticated circuitry and premium components for uncompromising musicality. The state-of-the-art design uses surface mount components and advanced engineering for proven performance, reduced signal interference, and long operational life. 3.5mm aux input. Total Output Power 60 Watt. The PT3300 amplifier adopts the most advanced digital technique in the world. Its 4 channels and 3000 watts of power make it the real acoustic center of any family movie theater. Features 2 microphone input jacks, 1 RCA jack dedicated for record line output, and an A/B speaker selector. Power Amplifier (Used) small home Pyle PCA3 amplifier in good condition. Condition is Used. Shipped with USPS Priority Mail Small Flat Rate Box. Hard-Wired?. InstallationSide Panel Power Input for Convenient ?. Installation - Side Panel Power Input for Convenient ?. Operation - Universal Standard Wall Plate Size. All critical accessories related to the operation of the item will be included. 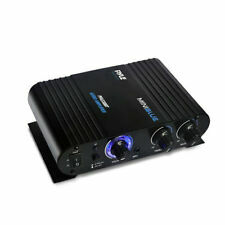 Pyle PFA400U Class-T 100 Watt 2-Channel Hi-Fi Audio Amplifier. Shipped with USPS Priority Mail Flat Rate Envelope. 3U Height w/Remote. This 3000-watt amplifier is rack mountable! Plug in up to two microphones using the front ¼' jacks. Easily adjust the treble, bass, and balance with the front-mounted rotary faders. Pyle PCA2 2 Channel Power Amplifier. Condition is Used. Shipped with USPS Priority Mail. 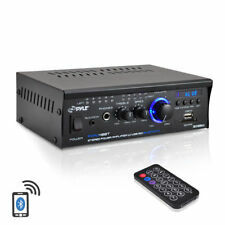 Bluetooth Amplifier Receiver Sound System - Digital Rack Mount Amp SPECIAL OFFER! What’s in the Box: Amplifier Receiver Remote Control FM Antenna Detachable Hardware Rack Mounts Power Cable Technical Specs: Rated Power input: 7W Input currency: 30mA Max power consumption: 15W Construction Material: Metal, Aluminum Alloy Panel Frequency response: 20-20KHz, /-2dB S/N Ratio: >85dB T.H.D. : <1.0% Input sensitivity: 200mV (Max Output: 6000mV) Battery Operated Remote Control, Requires (1) x ‘CR-2032’ Battery Maximum USB Flash & SD Memory Card Support Size: 32GB Digital Media File Support: MP3, WAV Power Cable Length: 4.5’ ft. Power: 110/240V, Switchable Dimensions (L x W x H): 19.0’’ x 4.7’’ x 1.7’’ Sold as: 1 Weight: 4. This Pyle Pro preamp is perfect for bringing a turntable's phono-level output to line-level output for your receiver or amplifier. Includes a 12 V DC adaptor for operation. Also outputs over stereo Â¼" jack.
' ' ---Separate gain control for preamp and subwoofer ---3000 Watts Peak Power ---800 Watts @ 2 ohms ---550 Watts @ 4 Ohms ---300 watts @ 8 ohms ---Inputs: RCA (2 Audio Sources) ---Outputs: Banana Binding Post (to Speakers) ---1 RCA dedicated for Preamp output ---2 Mono RCA dedicated for Subwoofer Output ---1 RCA dedicated for Preamp Output ---Digital Flourescent Output Display Meter ---iPod/ MP3 Input with Cable ---USB Reader Function ---Dimensions: 19" (W) x 3.5"(H) x 13"(D) ---Weight: 14.7 Lbs ---110/220V Switchable ---AM/FM Quartz Synthesized Tuner ---Sold as: Unit ---Weight: 17.27 lbs. The Pyle Pro P3201ATU is the perfect solution if you are looking for a High-Fidelity Preamplifier and a Power Amplifier all in one. Functions as intended. (1) preamplifier (1) manual (1) power cable (1) remote (1) mounting hardware. Color: Black. We personally understand the importance of saving money while getting a quality product. 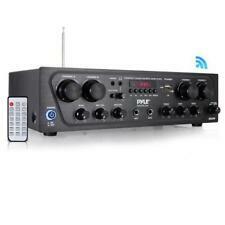 PYLE PD1000A 1000 WATT RACK MOUNT AM/FM RECEIVER W/BUILT IN DVD/MP3/USB . Condition is Used. Shipped with USPS Priority Mail. New in opened box.did not use for my project. Pyle PFA200. 60 Watt Class-T Hi-Fi Audio Amplifier with AC Adapter Included. Total Output Power: 60 Watt. 12V AC/DC Adapter. Microphone Input Jack. 3.5mm iPod/MP3 Input Jack. Input Power: DC 9 ~ 14.4V 2A. Digital FM tuner with LCD. Audio source input mode selector. Audio input: RCA (L/R) connectors. We focus on making purchasing online a pleasant experience. Our sales office is located in beautiful town of Redondo Beach, California, just a few miles South of Los Angeles International Airport. I only took it out of the box never been used. Built-in Bluetooth for Wireless Music Streaming. Tuner: Quartz Synthesizer. Bluetooth Connectivity Bluetooth Version: 3.0. Bluetooth Password Required: ‘0000’ (4 Zeroes). MAX Power Output: 300 Watt.
' 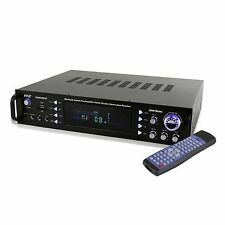 Features: 5.1 Channel Amplifier Receiver Hi-Fi AV (Audio Video) System Full HD 1080p Support, HDMI 1.4 3D HDTV & Blu-Ray Video Pass-Through Support Bluetooth Wireless Streaming Ability 2. It gives you 250W peak power which can be used for multi speakers w/ 4-8 ohms impedance allowing you to enjoy high quality audio. 7 INPUTS: The personal portable digital amp box supports iPod or MP3, USB, micro SD, AUX playback, built-in FM radio w/ digital LCD display, audio input and REC subwoofer output RCA (L/R) connectors. BLUETOOTH CONNECTIVITY: The small professional integrated indoor stereo receiver is equipped with Bluetooth wireless music streaming. Supports speakers w/ 4-8 ohm impedance allows you to enjoy high quality audio.